All these negative reviews and harsh internet buzz over the new 007 film Spectre are really grinding my gears. With a franchise as old and iconic as James Bond with over twenty films in over fifty years its inevitable to compare the newest entry to its predecessors, however the whole world seems to be forgetting about all of the Bond movies prior to Daniel Craig getting his license to kill in Casino Royale (2006) and are very adamant about comparing Spectre and how it falls short of the most recent Bond film Skyfall (2012). So let’s talk about Skyfall, which is also one of the best films in the series. The way that movie ended was a clear indication of what we should expect from James Bond films moving forward. Many of the staples for the series were conspicuously absent from Craig’s Bond films, but the final scene in Skyfall seemed poised to remedy that. We see Bond in a very familiar office and he calls Ralph Fiennes’ character Mallory “M”, and we learn that Naomie Harris’ characters full name is “Eve Moneypenny”. So Judi Dench’s M is out, a male M has replaced her and Craig finally has his Moneypenny. Oh yeah, and we met Ben Whishaw’s Q earlier in Skyfall giving Bond his new gadgets. Spectre is exactly the type of Bond film we were promised during the closing moments of Skyfall. The 007 series has gone through a renaissance during the Daniel Craig era. His debut film Casino Royale is arguably the best of the entire franchise and it rejuvenated the audiences to expect smart and innovative action and not just the same old routine they had all grown to love. But there were some ingredients that the Daniel Craig Bond pictures were missing that all of the previous Bonds had. The classic formula that was once tired and stale but still beloved by Bond fans was bound to make its full fledged return under Craig’s belt and it did with Spectre. Everything absent from Craig’s previous entries are now finally introduced into the new world that 007 inhabits. The backstory and constant sense that it needed to build up to where Sean Connery was in Dr. No (1962) are over. Everything is there and with the final scene of Skyfall looking so much like it came straight from Dr. No or any of the Connery era Bonds, the franchise was telling us, now it is time to get back to the formula. The happy comfort food many of the previous Bond entries delivered that the most recent films purposely abandoned. Spectre is exactly the James Bond movie I wanted. It follows the formula and it does so exceedingly well. It is the 007 movie that we were promised from the final moments of Skyfall. I pumped my fist in the air with joy from the opening seconds after the MGM logo because this is the first Bond film with Daniel Craig to open with the iconic gun barrel image of Bond walking onto the screen, shooting at the camera and then blood red dripping down on the screen over the white circle. Pierce Brosnan in the gun barrel logo from ‘GoldenEye’. Finally Daniel Craig got to have this open one of his 007 movies. Most of the criticism has been coming at SPECTRE the evil organization itself led by Christoph Waltz (as I stated in my review, the role of a Bond villain is the part he was born to play). It is the one element from Spectre that was not introduced in Skyfall that was pertinent to the early Sean Connery Bond pictures. People are saying Waltz is not developed enough, but his character is supposed to be shrouded in mystery, if anything I think they revealed too much about his backstory in this film. Much criticism has also befallen Dave Bautista’s henchman. I thought he did a fine job performing his role in a way very reminiscent of Robert Shaw in From Russia With Love (1963) with shades of iconic Bond bad guys Odd Job and Jaws. But the internet has been relentless with picking Spectre apart in every way. I agree that Sam Smith’s theme song, although good, is not very catchy and will likely not go down in the pantheon of great James Bond songs. However, I read one particularly harsh review that said it was as out of place as if “The Wiggles were performing at the original Woodstock”. Really? It’s that bad? I know Adele’s title track from Skyfall won an Oscar and is one of the best Bond themes ever, but come on. I think a lot of these unfairly harsh criticism is from the fact that people really loved Skyfall. 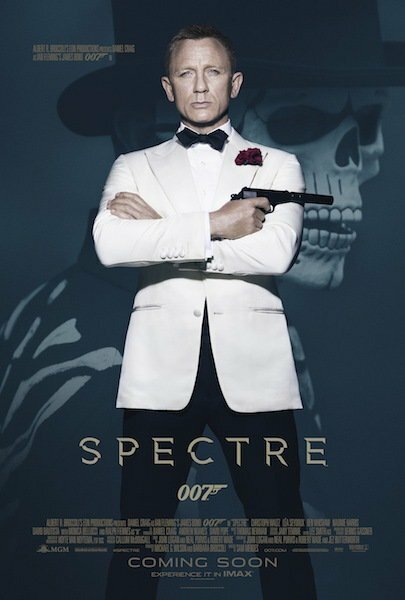 The new film Spectre has a similar if not higher pedigree than the previous Bond film. Oscar Winner Sam Mendes returning to direct, two-time Oscar Winner Christoph Waltz replaces Oscar Winner Javier Bardem as the main villain and Daniel Craig has already given some of the most vulnerable performances as the secret agent that after Skyfall it would be tough to top. The performances in Spectre are great. Daniel Craig seems a little more weary as Bond but that works for his character being older and wiser than he was in the earlier Bond films. As great as Christoph Waltz and Ralph Fiennes are in this movie, their performances are not as good as Javier Bardem’s vile Silva and Judi Dench’s M. But it is unfair to compare these performances because the script of Skyfall asked for so much more from its actors than Spectre does. People obviously loved Skyfall more than I realized and this is the backlash. Spectre is the Bond traditions we have always expected until Daniel Craig took over for an official reboot of the series. As I stated in my review, this is the Bond film all of his previous entries have been building up towards. Everything about Bond that audiences know and love is on display and they are all in top notch form. It is a shame that the expectations for Bond have changed. This is the exact James Bond movie I wanted Spectre to be.